Mueller did “not exonerate” Trump. Special Counsel Robert Mueller’s report did not come out yesterday. A summary from Attorney General William Barr was made public. Make no mistake: Mueller did not exonerate Trump, despite the president’s usual tweets and lies. Help put pressure on Barr to release Mueller’s full findings by sharing this thread of unanswered questions on Twitter. Trump pursued a Trump Tower Moscow deal until at least June of 2016. He actively sought a business deal with a hostile foreign government while campaigning. Have Trump’s financial entanglements with Russia compromised him during the campaign or as president? Michael Flynn lied to the FBI, and he’s likely going to prison for it. He interviewed with Mueller’s team for more than 62 hours. What did they learn? Jared Kushner attempted to create a secret backchannel—intentionally hidden from U.S. intelligence agencies—to communicate with the Russian government during the transition. Why? How broad was the investigation’s scope? Did Mueller look at Trump’s finances/connections with Russia prior to 2016? Did he examine Trump’s foreign policy actions as president? Did Mueller’s team investigate Trump’s closed-door meetings with Putin—the contents of which Trump guards with an iron fist, even going so far as to confiscate his interpreter’s notes? Trump’s associates made contact with Russia-linked operatives more than 100 times during the campaign and transition. There is no question as to whether Trump’s campaign did anything wrong—they did, and many of them will serve time because they lied about it. Barr auditioned for the job of Attorney General last year by calling the Mueller probe “fatally misconceived” and “grossly irresponsible.” Barr dismissed the possibility of obstruction of justice long before he saw Mueller’s report—undoubtedly why Trump picked him for AG in the first place. Bottom line: The public has yet to hear from Robert Mueller, and Trump is not exonerated. 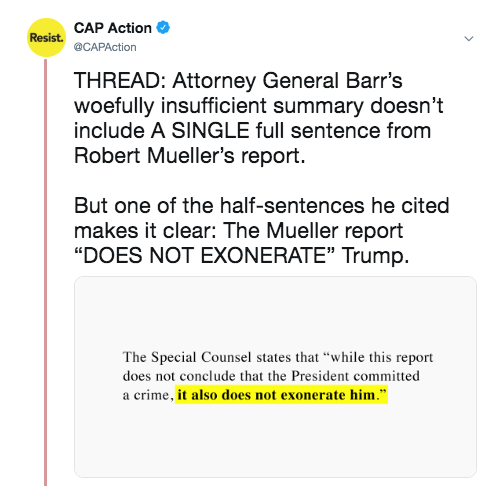 Barr’s summary is not the Mueller report—it’s a summary from two Trump appointees and was released without Mueller’s input. Share this tweet thread to make it crystal clear: Mueller’s full findings must be made public.